Love to Eat, Hate to Exercise: How Average Are You? 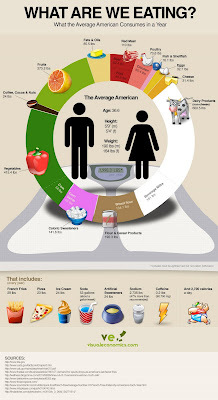 Visual Economics has published this fascinating glimpse into the annual food consumption of the average American. Click on the image above to see it full size. I eat maybe a plate of fries a year (bumming a few off my kids once a month or so. 5-10 slices of pizza a year. Maybe the equivalent of 2 bowls of ice cream a year. No more than two glasses of pop a year (we don't call it soda here in Canada, at least where I live), mostly in the form of a sip here or there. I watch my sodium. Try to stay well under 1,500 mg per day (or whatever the "safe" amount is supposed to be). An average of 1 1/2 cups of coffee a day. And certainly well below 2,700 calories a day. Probably somewhere in the vicinity of 1,700. And yes, I'm still overweight. But how do you feel? Do you feel healthy and energetic because of the way you treat your body despite carrying a few extra pounds? I'm still overweight, sure, but would I give up my lifestyle now to cram down several pounds of Twinkies and French fries? Hell no! If eating healthfully gives you energy, makes you feel good and could reduce your chances of Diabetes, Cancers or heart disease, I would have to say that is more than fair, it's awesome! I was brought up in a home where healthy food was the norm, so I can't compare how I feel now to anything else. I'm happy about the way I eat, try and set a good example for those around me and get on with things. In actual fact, I've got a lot more to be concerned about health-wise than my weight. So I try to keep the negative messaging in my head about weight down to a dull roar!